Maurice Sendak–Kids don’t know about best sellers. It’s why I like them. Liking kids isn’t very hard is it? They are cute, sweet, new, innocent, lovable, loud, ornery, mean, snotty, brats… WHOA there! What happened to the liking kids part you say? Hey, I had to get your attention somehow! Now back to why I like kids, especially as it relates to being a writer. 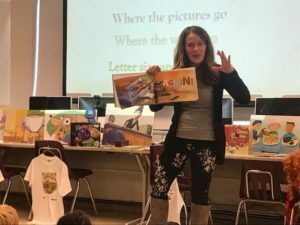 I shuffled to the front door of a school last week on a blustery sub-zero day to do author presentations. I had my usual look going: kind of a cross between a bag lady and a traveling vacuum cleaner salesperson. I had my son’s old back pack stuffed with display stuff, a large art-portfolio and laptop case in one hand, my full-color banner case slung over a shoulder, and a cardboard tube of printer sheets under one armpit. In my other hand I held (with all my might!) the knotted top of a heavy garbage bag full of costumes and a sharp edged 3’x4′ metal printer plate that was looking to take flight to the next county in the frigid wind. (At times, the life of an author is no more glamorous than that of a pack-horse.) Once inside, I heard squeals, “It’s her! The author’s here! Ooooh! That’s Mary Bleckwehl!” I laughed, happily dropped everything to the floor and gave a few high fives with these new fans who were all of 6-7 years old. Then I headed back outside to carry in heavy boxes of books across the icy sidewalk. I am not famous. I did not write Harry Potter. But these kids were absolutely elated to see a real live author walk into their school! They were obviously well-prepped by their teachers for my visit and knew me and my books because of their teacher. Yes these kids not only made me feel like the trip on icy roads to their school was worth it but they were genuinely interested, had great questions, and… their teachers? The way they talked to their students, easily laughed along with them and spoke kindly to them-well, it is clear that kindness is well and alive in many schools. Kids and teachers. I do like you. You keep me coming back. Garbage bag and all.